Visit the gallery and you will find American made pottery, jewelry, photography, prints, paintings, art glass, metal art, stained glass and more. Have fun visiting the gallery or shopping online! Large Hand Blown Glass Bowl by Rollin Karg. Let us help you find that amazing piece of Art Glass. 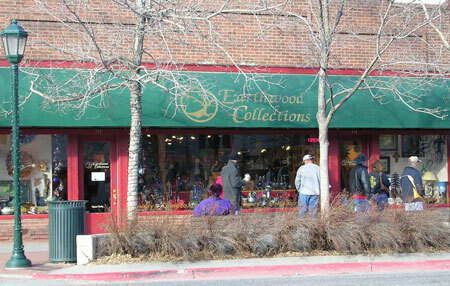 Enjoy the May First Friday Art Groove with Earthwood in Estes Park! Live Jazz concert in the gallery with Max Wagner (sax) and Stu MacAskie (piano). This concert is FREE and Fun. Fine Art Show with Loveland artist Vicky Russell. Complementary refreshments, wine and snacks are provided. Ride the FREE trolley that circulates between the participating galleries. Great fun — invite all your friends and enjoy the cool fun in downtown Estes Park every First Friday, year round. Our wide selection of American Art always makes it easier to find that perfect gift for your loved ones! Mark your calendars - we host new shows every month and hope you can attend them all!